The annual report of Perpetual Care receipts is convincing proof of the increasing appreciation of this form of what might be called "Cemetery Insurance". More and more those whose lots were acquired before the new system." of Perpetual Care was inaugurated are coming to understand the advantage of securing Perpetual Care and thus ending for all time their worries about the care of their lots. 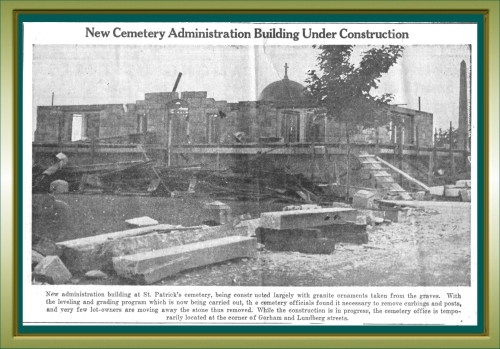 But, besides the considerable personal advantage, thus gained, they enjoy, also, the satisfaction of knowing that they have helped materially to the success of the great project now in progress, of making St. Patrick's Cemetery a place of peaceful beauty that will forever proclaim the Christian teaching of respect and enduring love for the departed. To have done one's just and proper share toward realizing that blessed purpose may well be a source of joy and honest pride. During the year just passed the work of removing curbings and regrading lots has been continued. In a few years this will have been completed and the next step in plans for beautifying the Cemetery will be undertaken. The most important work of last year was the construction of a much needed administration building. Now, at last, we have ample space for the transaction of Cemetery business and practical protection for valuable records. Besides the usual office features there is a spacious waiting room for those obliged to wait for out-of-town funerals and a convenient private office where confidential matters may be discussed with the superintendent or his assistant. It is gratifying to know that the building and its interior arrangement have elicited many favorable comments from superintendents of other cemeteries who have come to inspect it. Built of stone salvaged from curbings the new building is a memorial to all those from whose lots the curbings have been removed. The Cemetery management likes to believe that this new edifice and the growing beauty of the entire Cemetery will be not only a source of justifiable pride to the lot-holders but that it will constitute a splendid beauty spot for Lowell as well. 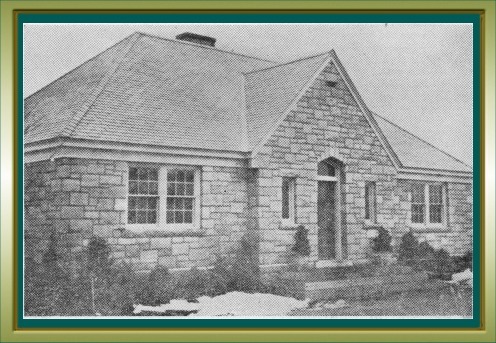 A new administration building at St. Patrick’s cemetery, made almost in its entirety from curbings which had been removed from cemetery lots, has been completed, and it stands not only as an addition to the beautiful structures of the city but also as a tribute to the zeal and cooperative effort of a few men. Originally, it was the intention of cemetery authorities to remodel and enlarge the old administration building and to provide a fireproof section to safeguard the cemetery records. But it was soon discovered that the old building had reached the last stages of decay and that a complete new structure was called for. How to construct a new up-to-date building with the very limited amount set aside for improvement is the old office was not an easy problem. In fact, it would be a problem still unsolved were it not for some fortunate circumstances and for the splendid cooperation of all those engaged in the work. The curbing which had been removed from cemetery lots provided an abundance of granite of the finest quality and of sufficient variety in tint and texture to relieve the monotony and heaviness of the low granite walls. The type of masonry also contributed to that end. The main door is set in a typical Tudor arch. The door is of heavy oak with iron latch and hinge-straps and a small window of leaded glass. In the interior the Tudor effect is carried out by the oak-paneled walls and by the arch which divides the lobby from the office section. On entering, on sees a rough granite fireplace, the stone mantelpiece supported by heavy granite corbels. The structure of the beautiful piece was also made possible by use of curbings removed from the cemetery lots. Hung on the wall above the fireplace is a splendid old copy of Ruben "Descent from the Cross," to the left of the lobby is the superintendent’s office, adjoining which is a smaller room for drawing and map-making. To the right of the lobby is the office proper. Here the files and records are kept in the fireproof cabinets and here, too, most of the cemetery business is transacted. The floor of the office is linoleum tile; all the other floors are asphalt tile, and all sub floors are of concrete. The building is air-conditioned by a Delco "Conditionair". As has been said, this building could not have been constructed were it not for the splendid co-operation of those immediately interested in the work. Guiding spirit of it all was Rev. John McGarry, D. C. L., director of the cemetery, whose selective taste and boundless energy are in large part responsible for the beauty not only of the present building but also of the appearance of entire cemetery. Mr. James Charles Flaherty, the architect, besides drawing the plans for the building, gave a great deal of time and attention to the matter of cutting expenses. Frederick F. Meloy spent many evenings discussing costs and methods of construction while John J. Brady, the contractor, made a very generous donation of materials. Supt. John J. Meagher and his assistant, Frank Redding, worked unstintingly to bring the project to a successful conclusion. Finally, the contractors, one and all, showed an interest and a spirit of helpfulness far beyond the letter of their contracts.